VHS was dead. In fact, A History of Violence, the last major Hollywood title put on videocassette, appeared in 2006. But the demise of VHS didn’t mean that Americans had wearied of watching movies in their living rooms. In fact, we do more of it all the time. A recent Harris Poll revealed that 57 percent of consumers would rather watch a film at home than in the theater. A survey from Motorola showed the average time we spend watching movies at home has jumped from five hours a week to six. So while the medium might change, the love for home screening had not—and that’s the lesson on view in the two ads here. In a technical sense, the only difference between this 1985 ad for CBS/Fox Video and its 2014 Warner Archive counterpart is that magnetic tape has ceded its place to digital. Otherwise, both ads testify not just to the profitability of the back catalog, but to a curious truth about American cinematic tastes. Even the most obscure, marginal B-grade movie has someone, somewhere, who loves it. Actually, a loyal fan base is probably the only thing that can explain why media companies this rich can get away with creating ads this marginal. “Neither is particularly pleasing to the eye or says much, visually, about the storyline of the films,” observed movie marketing consultant Sheri Candler. 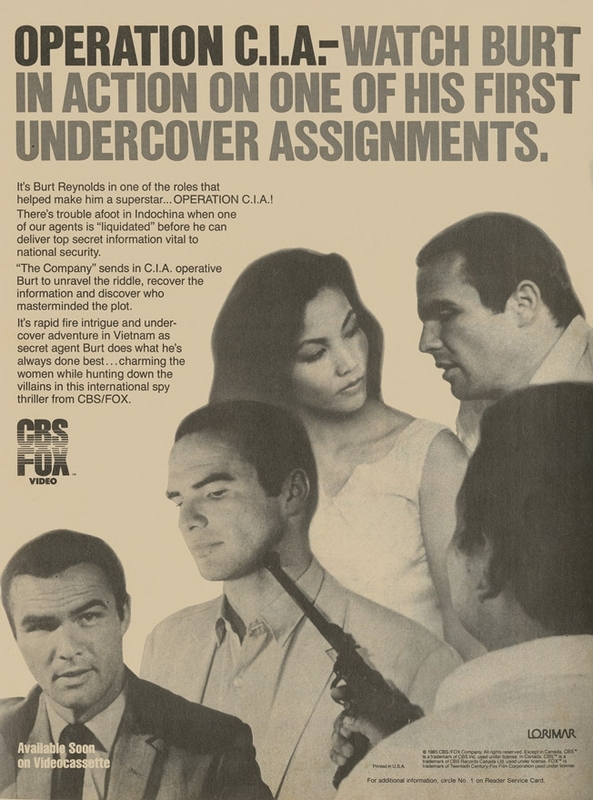 Even by the standards of the mid-1980s, CBS/Fox’s cutout stills of Burt Reynolds in the 1965 flick Operation C.I.A. look like a photo collage from a high school yearbook. 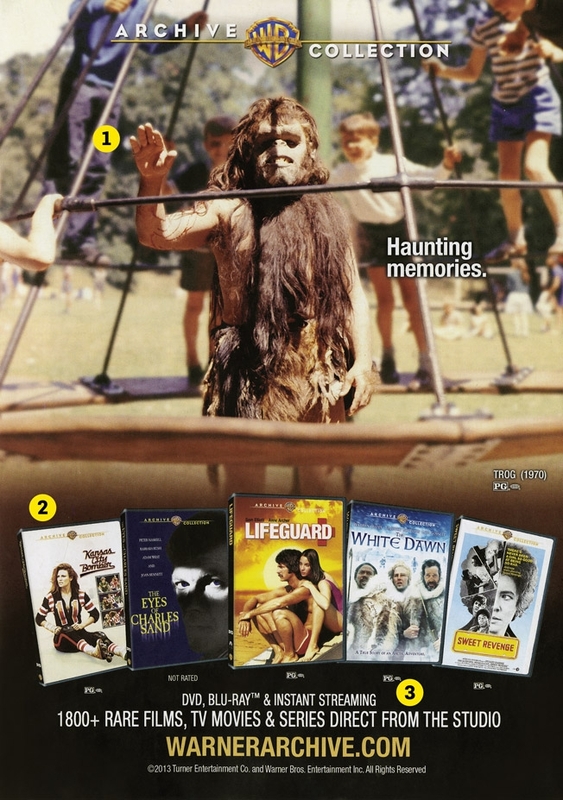 And with this creepy, playground still from Trog, the 1970 film about a malevolent troglodyte and the anthropologist (Joan Crawford) who discovers him, Warner hasn’t done much better. Besides, would it make sense to have sleek, cutting-edge ads for flicks with IMDb ratings of 2½ and 1½ stars? Of course not. Fans will recognize the stills, and fans will be buying the movies. Just not on VHS anymore. When this ad for Operation C.I.A. (“Available Soon on Videocassette”) appeared in 1985, Fox had only just wised up to the back catalog’s profit potential. In 1977, the studio licensed 50 of its old titles (including Patton and The Sound of Music) to a company called Magnetic Video. The public response was so huge that Fox wound up buying Magnetic out, then teaming up with CBS to create a home-movie behemoth. 1. Influenced by 1968’s Planet of the Apes, Trog was just plain creepy. But as one fan said on Rotten Tomatoes: “I have a soft spot in my heart for the stupefying, inexplicable trog.” That’s the sort of dude who’s going to buy this movie. 2. A Roller Derby flick starring Raquel Welch? “I’d imagine these aren’t the best films in the Warner archive,” said Candler—and she’s right. But pop-culture leftovers still return decent margins. Plus, if Warner left them on the shelf, they’d make zero. 3. For all the rage that instant streaming is, the fact is only about a third of cinephiles watch movies that way. According to a Harris Poll, 47 percent and 37 percent, respectively, still like DVD and Blu- ray—possibly because these formats allow fans to buy and keep the films. Which means they can watch Trog again and again.